Do not arrive at a new destination after dark. Do not stay in a hotel near the train station. There are exceptions, of course. Unfortunately, Munich wasn’t one of them. 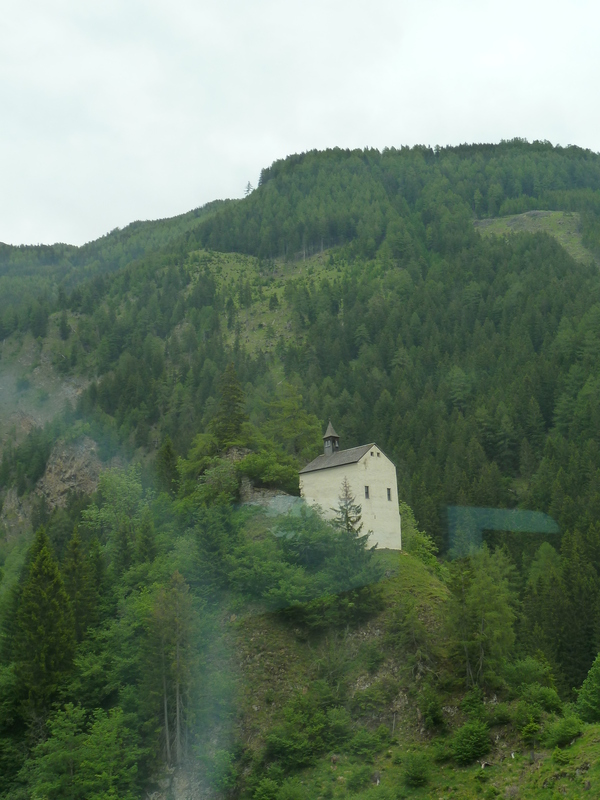 The train from Ljubljana was filled with alpine scenery, tiny villages, castles clinging to mountainsides, empty ski-lifts, waterfalls, rivers, lakes, and low-eaved houses in distant towns I’ll never visit. We whizzed along, ensconsed for the most part in our own private compartment thanks to scant numbers of passengers, through Slovenia, Austria, and at some point passing into Germany. I’ve visited 25 European countries, but somehow never got around to Germany. Finally the day had arrived. Or rather, the night. It was 10pm by the time we exited Munich’s Central Station, blinking and disorientated in the damp, neon-lit streets, a far cry from Ljubljana’s tree-lined boulevards and Sarajevo’s steep cobbles. A bottle smashed into the ground nearby, and a few drunks staggered across our path as we followed the bright lights of the cabaret bars leading us to a road packed with cheap hotels. No AirBNB for us this time: there’s only so much research one can handle for a week-long holiday and our pre-emptive booking had run its course, with Munich’s accommodation made on a last-minute whim. Litty’s Hotel offered an “en-suite shower” for an additional €7 although it turned out not to be a euphemism for “bathroom” but literally just a shower cubicle, in the corner of the bedroom. The glamour continued the following morning when we rented bicycles from Frankie’s Bikes just in time for the heavens to open. Munich, it transpired, is actually a fascinating city, although viewed from under a dripping wet parka, I can’t help feeling that some of the magic was probably lost. We revelled in the pedestrianised areas around the city centre, carefully wheeling in between pedestrians with shopping bags, until a random woman stepped in front and informed me that it was “very expensive”. It took me a while to realise that she didn’t mean my bike (since it clearly wasn’t), but the action of riding on the pavement which came with a fine of €50. Indeed, we realised that nobody else was daring to break this law. I got the distinct impression that ignorance would not be an excuse with Munich’s law-enforcers, so off we duly hopped. Continuing our accidental theme of “Olympic host cities which are now remembered for darker reasons” (can two cities be considered a “theme”? 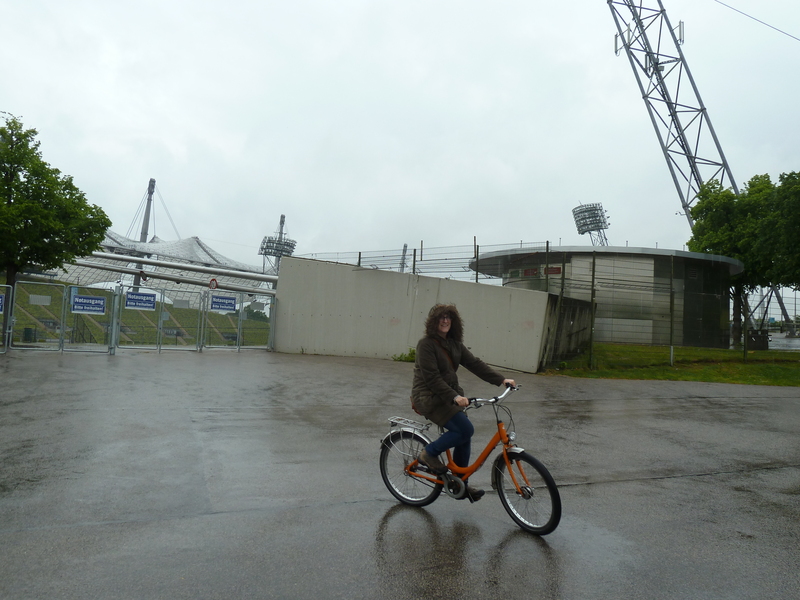 ), we headed to the other side of Munich to explore the old Olympic park. They’ve transformed the village and part of the complex into housing, schools and parks, and it seemed a terrific use of the grounds. Unfortunately it was really tipping it down by that point, so after a half-hearted cycle around, we headed back (damply) into town. It was of paramount importance that we stop for a beer and some hearty German fare and the helpful man at Frankie’s pointed us towards Hofbräuhaus. Soaked to the skin, utterly miserable, and having done literally no research whatsoever into our German stopover, we decided to cut our losses and head straight over. Hofbräuhaus is gigantic, traditionally-decorated, steeped in history and stuffed to the gills with as many tourists as I have ever seen in one place. No, it wasn’t the beer hall of our dreams, a local secret where only true Münchner dared to tread. But it served steins of ale brewed right there on the premises, a hunk of pork alongside a single, enormous, steaming potato dumpling, and everything in sight was sturdy, blunt, and reassuringly German, from the table to the beer to the waiter. Benches are meant to be shared and it wasn’t long before we found ourselves squeezed between two young guys who’d just moved to Munich, and six Floridians who were already well and truly soused and heartily sloshed their glasses into the air with great enthusiasm every time the oompah band struck up. After a while we’d dried out enough to escape the madhouse and meet an old friend of mine, Lena, a lovely German girl whom I’d met during my New Zealand trip in 2007 and shared a memorable day in Abel Tasman National Park. Lena was a Münchnerin born-and-bred and a fantastic tour guide. We walked around the city learning about the various historical buildings and she explained about the Lederhosen and Dirndl which appear to be sold in every single Munich shop. Not German so much as specifically Bavarian, it seems that every genuine resident owns at least two variations of this traditional dress: an expensive tailored version, often made from silk and heavily embroidered, for high days and holidays; and a cheap polyester knock-off for Oktoberfest. She let us in on the secret of out-of-the-way parties which happened on occasion in the surrounding areas, where locals in full traditional dress celebrated with no tourists in sight. If the prospect of joining one of these events isn’t enough to send me hurtling back to Germany, I don’t know what is. We wandered through the city seemingly aimlessly but Lena had a destination in mind: she was taking us to see some surfing. Since we were very much inland, I had assumed some sort of language miscommunication but it turned out that she did in fact mean surfing. On surfboards. In wetsuits. In Munich. On the Eisbach River, at the edge of the English Gardens, lies a spot which is now infamous as the location for urban surfing. As the relatively narrow river emerges from under a road bridge, it passes over rocks and other debris which lie dangerously close to the surface, creating rough waves which offer fantastic if not hugely hazardous surfing. Recent heavy rain meant that the river was unusually high and although the day was cold, ten men (and one woman) lined the banks to try their hand in the water. It was an exercise in respectful queuing as each person took their turn, weaved in and out of the rough yet consistent waves, fell off his or her board and clambered out further downstream whilst the next person hopped in behind them. We watched several rounds, transfixed by their daredevil attitudes, and astonished that the stereotypically German attitude towards health and safety had been overlooked on this one occasion. Lena explained that it was absolutely illegal but these days the police simply turned a blind eye, such was its popularity. Besides, nobody but the very experienced (and/or incredibly foolhardy) would dare to enter the water at that point. Later on, following the river along its winding course through the English Gardens, we came across another spot of waves, not quite so tempestuous, where a less-confident surfer was building up his courage to join in with the big boys upstream at a later date, perhaps. Lena also pointed out another place in the same stream where, in warmer months, bikini-clad students of the local university would slip into the water and allow the current to carry them downstream in a calm, stately, watery procession. Such reckless, precarious freedom was a fascinating antithesis to the heavily-touristed bierhalles, carefully-observed rules, and magnificent, stately rathaus and government buildings which made up the bulk of Munich’s facade, and I was grateful to have witnessed both sides of this city in the short time I had to explore.